In today's blog we take a look at the average value and number of shares traded on the JSE per day. Data supplied by PSGOnline. So just how many shares are traded on daily basis on the JSE? Or what is the total value of shares traded on the JSE on a daily basis? We take a look below. 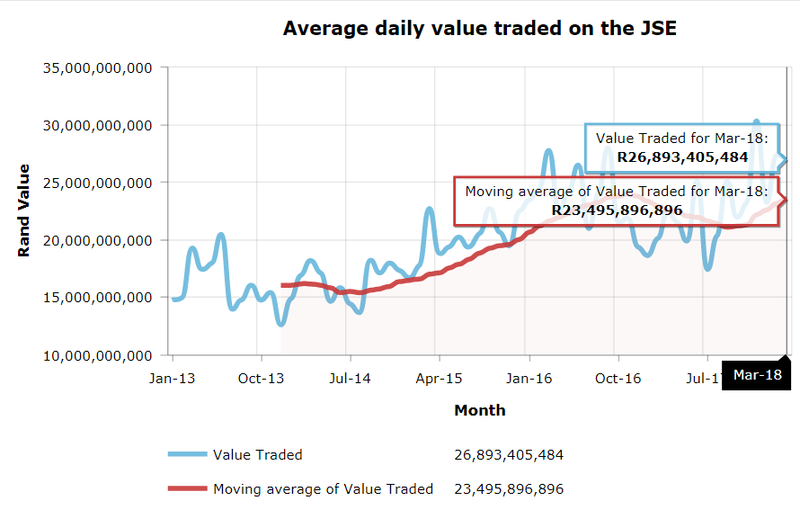 The interactive graphic below shows the average number of shares traded and average value of shares traded on the JSE on a daily basis. The average daily value and number of shares traded are calculated per year. While the trend in the number of shares traded and value of shares traded are very similar, the value of shares traded is a lot more volatile than the number of shares traded. Strong growth in the number of shares traded and the value of shares traded has been experienced over time. ​Value of shares traded: R25.8billion in shares traded on the JSE per day. The graphic below shows the average value of shares traded per day on the JSE on a monthly basis, while the graphic above look at annual values. We also added a moving average (the average of the 12months of a year) to get the underlying trend in the monthly data, as it is rather volatile. As one can see from the graphic abovethe blue line which represents the monthly averag daily value traded on the JSE is extremely volatile and determining an underlying trend from this is pretty hard to do. The red moving average line gets rid of a lot of the volatility and identifies an underlying trend in average value of shares traded on the JSE on a daily basis. As the graphic shows the underlying trend has shown sharp increases in the value traded per day over the years, except for the period during November 2016 and November 2017 when the underlying trend turned negative. ​However it has picked up since then and is close to highs reached in November 2016, where the average Rand value of shares traded on the JSE amounted to R23,9billion per day. For March 2018, the average Rand value of shares traded per day on the JSE amounted to R23.49billion per day on the JSE. Gone are the days when R8billion in shares traded on the JSE was seen as a very busy day. Shares such as Naspers, British American Tobacco etc has shown massive price increases over time, leading to strong increases in values traded as these share prices became every higher. As we mentioned in previous articles, the fortunes of the JSE (the listed company operating the stock exchange), is directly linked to the amount of activity on the market, and not the performance of the market itself. And based on the graphic above and the improving trend of the red line, one can expect that the financial fortunes of the JSE is on the up, as the average value and trading activity on the market picks up.